As part of the the Adopt A Rack project a bike rack appeared this morning on Broad St just south of Chestnut in front of the Land Title Building, home of the Bicycle Coalition. Getting a bike rack on South Broad St has not been easy, in 1997 the defunct Avenue of Arts Inc. frowned on the first wave of 800 Center City bike racks and no racks were installed on the street (despite the presence of chaotic school racks in front of the UArts). Even when more racks were installed in 2006 city officials balked, placing the racks instead on adjacent side streets such as Spruce and Locust. The Bicycle Coalition signed for or "adopted" the 100+ new racks in the Center City and Old City districts. 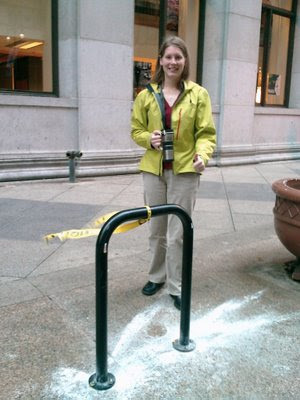 Bicycle Ambassador Coordinator Breen Goodwin admires the first of many new bike racks that will adorn South Broad St. I noticed new racks in Old City this week. Thanks for getting it done! would be very curious to hear bicyclists' comments about this design. Welcome to the warhammer gold, In here you can buy the warhammer Online gold, Do you know that the warhammer money in the game is very important, If you had more cheap warhammer Online gold . I think you can get the tall level, quickly come here to buy warhammer gold. I like play online game, I also buy Aion gold and Aion gold, the Aion china gold is very cheap, and use the Aion China kina can buy many things, I like Aion chinese gold, thanks, it is very good.